Hi folks! 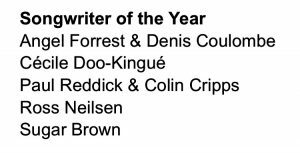 Well, this Halloween I had to double check the inter webs as I read that I had been nominated for Songwriter of the year at the Maple Blues Awards. If you’re wondering what these awards are, here is what their website says: “The Maple Blues Awards is Canada’s national blues awards program. Its goal is to promote blues music across Canada, and to recognize outstanding achievement in the field.” It includes a nationally recognized awards show put on by the Toronto Blues Society at Koerner Hall in Toronto. This year there is also a conference called Blues Summit, where buyers form around the world get together and see what’s happening in the Canadian Blues landscape. I have been writing songs for about 25 years. A couple years ago I was lucky enough to attend a songwriting camp by Steve Earle. This really changed the way I approach writing and has made a big impact on the quality of my writing. I have long been striving to write what I think are “good” songs. I once had a conversation with a muso friend and he remarked that he didn’t know what made or was, a “good” song. I half jokingly said, “it’ good if you like it”. I think it’s more complicated than that though. I still don’t know the answer but I know I don’t have to “like” a song to think that it’s quality. There’s more to songs that how they make you feel. I can appreciate a good song architect even if the song doesn’t move me. Rhyme patterns. Beats per line. Alliteration. I like the tools of writing. I like using them. I like when I get stuck on a line and have to bust out my tool bag to dig around for the right line or word. Sometimes production turns me off and I walk away form a tune before I give it a chance. 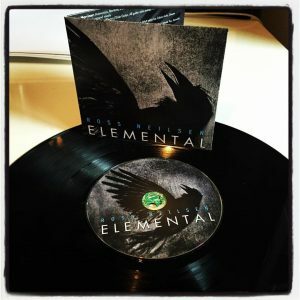 I’ve turned around a lot though over the past few years and have really opened up and started looking at music that I wouldn’t have given a chance in the past. The reason for this is that, One: I was missing out on good music and, Two: I want to learn how to write better songs. The latter has been a goal of mine for years. In the past couple years I finally feel like I’m making headway. I cut my teeth listening to Dylan, Neil Young, The Band and so many others that have a deeper context to their writing. I’m not saying that every song has to be deep and have an earth shattering underlying meaning but if you’re only adding lyrics to get you to the next guitar solo, well, then you may be a guitar player, not a songwriter. I enjoy a silly pop song or an easily digested melody with no hidden meaning behind the lyric as much as the next person but I also want to be moved. I want a line to stir my brain. To make me think. To turn me on.. As a result of what I want from others, I have been writing my own material with that in mind. I’m not sure that’s right or wrong. It’s just how I go about it. I appreciate that people listen and sometimes ask me about lyric. I have on occasion had such heavy duty reinforcement from listeners, that my music has helped them in tough times, that I know I’m on the right track. As long as I create music I will never stop trying to write a quality song. I thank you so much for listening and supporting my music. I have been nominated for awards before but this one feels good. I’ve worked hard to get here and I’m happy that work is being acknowledged. Particularly happy to be in a category with Paul Reddick. I’ve been a fan of Paul’s and under his influence for many years and to be mentioned in the same category is further indication that I’m slowly figuring something out. I hope to someday be on that kind of level that can invoke a mini-movie in four or five minutes, like Paul can. I’ve had good teachers and I’m grateful for that. Still I will continue to work to be better. Thanks a bunch. I wish this wasn’t a component of #awardsshowbullshit but it is. Thanks for any kind of support. Big love! Did you miss last weekends amazing episode of Killer Tunes? fear not…you can stream or download it right here…. This week’s episode features tunes from Doylae Bramhall, Warren Haynes, Ray Charles, Aretha Franklin, Sharon Jones, Taj and more! Dig it! Well it’s September. That was fast eh? One good thing about this month’s arrival is that it means Harvest Jazz & Blues Festival is right around the corner. With that in mind This and next weeks, shows are all about the bands of Harvest. This week has music from The Drive-By Truckers, Justin Townes Earle, Blackie & The Rodeo Kings and more! I hope you enjoy!